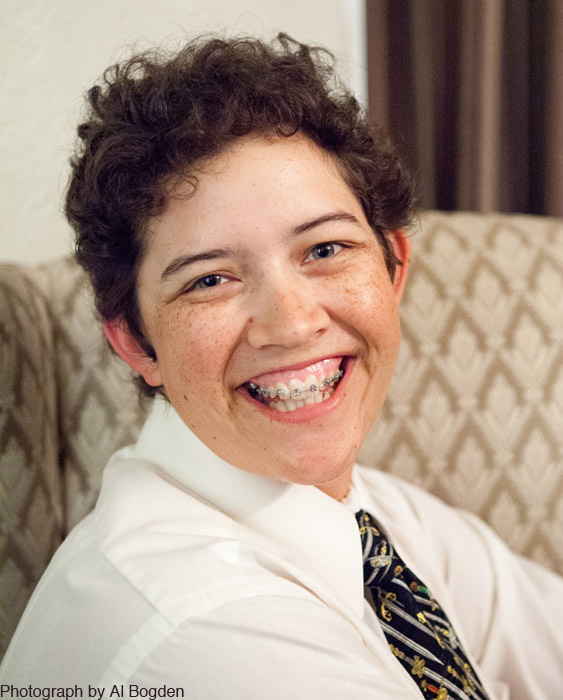 Occupation: I am a speculative fiction author, artist, illustrator and cartoonist, though I tend to blur the lines between those labels quite a lot. Teachers/Education: I didn’t have teachers as many people would recognize them, being unschooled since the age of six. Unschooling, by the way, is a bit like homeschooling, but the curriculum is determined entirely by the kids. In my case, it was made up of Bill Nye the Science Guy, Reading Rainbow and as many adventures out of doors as possible. As a result I had a very uneven learning curve, though by the time I was a teenager I’d filled in the gaps so well most people assumed I’d been to school. The fact that I haven’t still surprises people. I was influenced by a great many wise people growing up – my parents and extended family, and my many adult friends. Even now I don’t consider my “education” complete, since I think the worst thing you can do is think you know everything. That just stops you learning more. Also, with the way our knowledge of the world is constantly expanding, I think you have to keep an open mind otherwise you risk being left behind. Places Traveled & Places lived: Though I’ve lived all my life in California, specifically the middle bit up in the mountains, I’ve been fortunate enough to visit Italy, England and Wales. I have particularly fond memories of cycling from Lucca to Firenze (Florence), and of visiting Caerphilly Castle outside of Cardiff. I would very much like to live in Oxford one day, though I think I might go a little mad without any mountains nearby. Loves: I love the outdoors and things to do in it. Like riding horses, or bicycles, or rivers. I like to joke I can master any sport one does sitting down. Despite this, I also like hiking and just being out in nature. I think this informs my love of art and writing, since a lot of what inspires my pictures and stories are places I’ve been. Seeing new sights sparks things in my imagination, which grow, and I use mediums like painting or storytelling to bring those imagined things into the real world. For as long as I can remember I’ve loved fantasy tales and stories with a supernatural element – and this is reflected in much of the work I do. At the same time, I am fascinated by science and technology, even the parts that are a little beyond me. Often I find inspiration for my stories in new (or old) scientific theories. I like to say I write science fan fiction, for I am a fan of science, rather than a true scientist. Creative Works: My official writing and art site (complete with blog and commission information) is GoldeenOgawa.com. A catalogue of my books can be found on my company’s site, heliopauseweb.com, and I keep a deviantART account up to date with all my latest visual work: goldeenherself.deviantart.com. For a specific example, I’m very pleased with my “Death and the Cat” short story, which is a fun blend of both my writing and painting. It can be read for free online on my website. Quote: “Do stuff you’ll be proud of later.” This is something I have to remind myself of quite a lot, since I derive the greatest pleasure from doing things I can look back on later and think “Yes, I am glad I did that!” even if what I want to do most of the time is watch silly TV shows and eat ice cream. 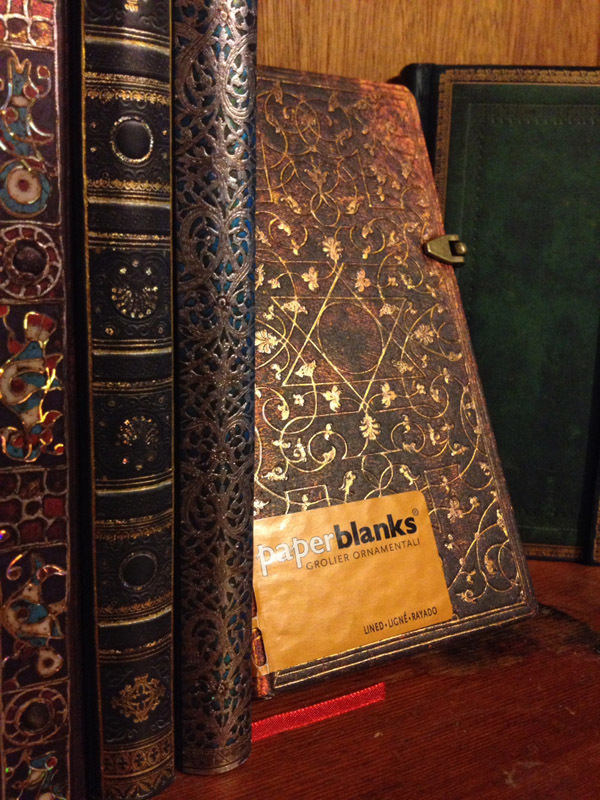 I stumbled upon Paperblanks® quite by accident at an art supply store called University Art in downtown Palo Alto. I had gone there to treat myself after a rather trying dentist appointment, and there in the front was a display of the most *amazing* books I had ever seen. I remember I spent ages agonizing over whether to get a Silver Filigree or a Nocturnelle (I eventually chose the latter). At the time I had no idea what I would use it for, except that I knew I wanted to take it out and write in it every day. 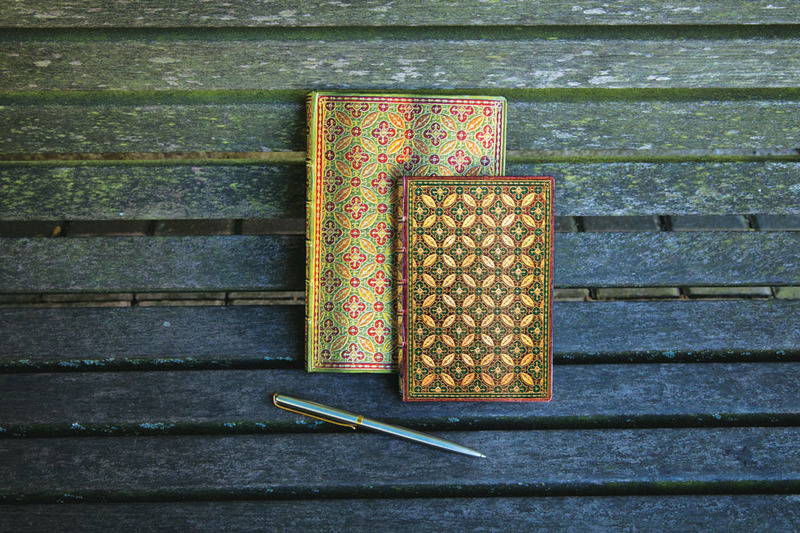 When I got home I looked up Paperblanks® online and… well the rest is history. 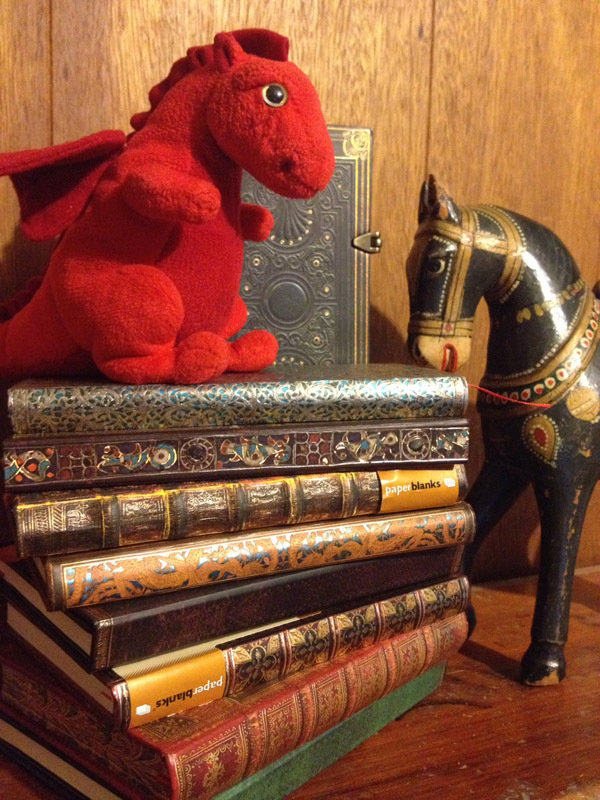 This is my current collection of Paperblanks® journals, along with my traveling companion, Dafydd the fuzzy red gay dragon from Wales, and a wooden horse who helps keep my books from falling over. The journals with the stickers on are the ones I haven’t started yet. How many can you recognize? 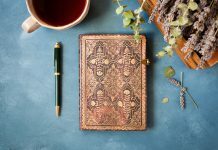 (Paperblanks® employees, no spoilers please!) Dafydd, by the way, is on Twitter: you can follow him @DafyddEihun. I have trouble with this question, since my favorite Paperblanks® design is usually the one I am using at the moment. However, just looking at the journals that I own, I think I have a preference for the darker, more intricate patterns like the Grolier Ornamentali, Silver Filigree, Baroque Ventaglio, Safavid and, of course, Nocturnelle. I was monstrously pleased by the Equinoxe collection released this spring, and I like the new Mosaïque Safran version of the Parisian Mosaic. But, mostly, it’s whatever notebook I’m currently writing in. That depends entirely on which one you pick up! You might find an account of one of my bicycle rides, runs, horseback rides or other outdoor adventures. I don’t keep a conventional diary anymore, since I found I was only writing in it when I was depressed or sad. I realized this made my life look like a string of unhappy events, and decided I would only write in my journal when I was in a good mood. And I’m usually in the best of moods after I’ve gone on a bike ride. I usually include little illustrations of things I saw that day, and I find keeping a log helps me remember these rides which tend to run together otherwise. Or, you might find random scribbles – sketches of logos, ship designs, characters or drabbles of half-finished poetry. 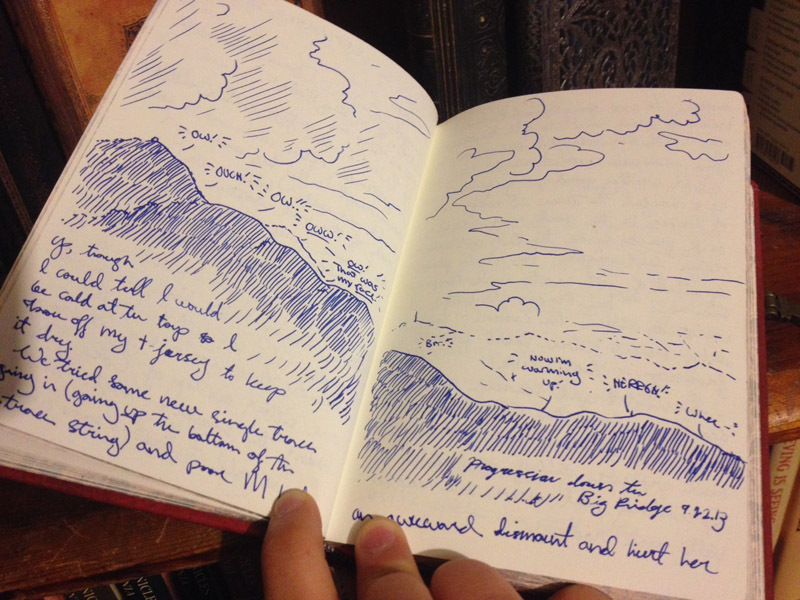 For these I keep a general journal that serves as a means to record my creative work, miscellaneous notes and life sketches. I love going to cafés to work (I’m writing this in a café, in fact! 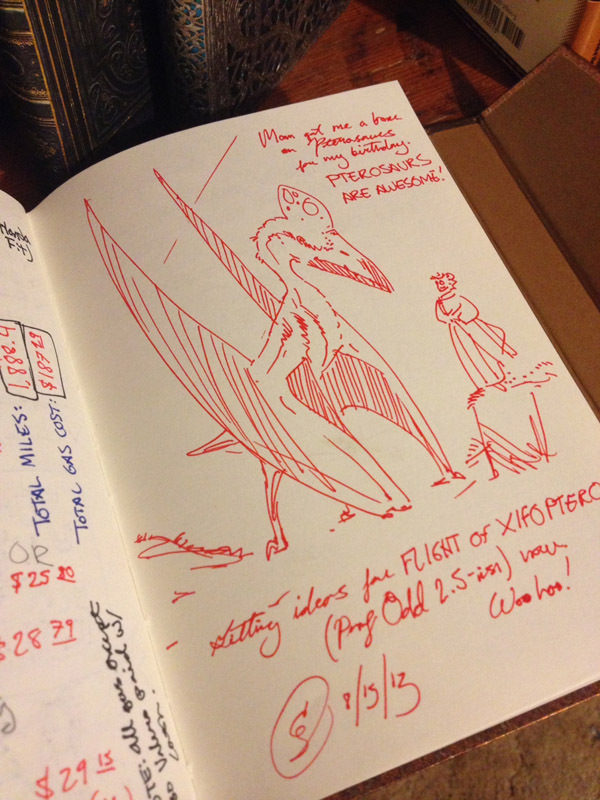 ), and I always bring my journal so that if I see something interesting I can sketch it. I also use it to knock out concepts for cover designs, logos and such. The memento pouch on this journal is chock full of business cards – I am so thankful for that little pouch! My current “misc. journal” is a Safavid Midi with blank pages. I prefer sketching on blank pages, and while I don’t mind lined paper for my riding log (since most of that is writing anyway), I find I really need the blank pages for drawing. 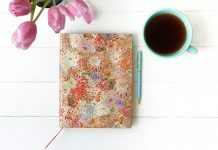 It can be frustrating, since retail stores never seem to have blank Paperblanks®, but luckily there is a wonderful online shop (lovenotebooks.com) which usually has the books with blank pages – if they’re available. I also keep a writing log. This is where I note the number of words I’ve written each day, which story they were for, where I was and also any thoughts I had on the writing session. It may sound silly, but I find it incredibly helpful in motivating me to get my writing done each day. It’s like a little treat – getting to open up a beautiful journal after having slogged away at my laptop for a few hours. It’s also turned out to be a wonderful record of all the different stories I’ve written, and looking at my past progress also helps encourage me to keep moving forward. Because each entry is very short, it takes me quite a while to fill up a whole notebook. 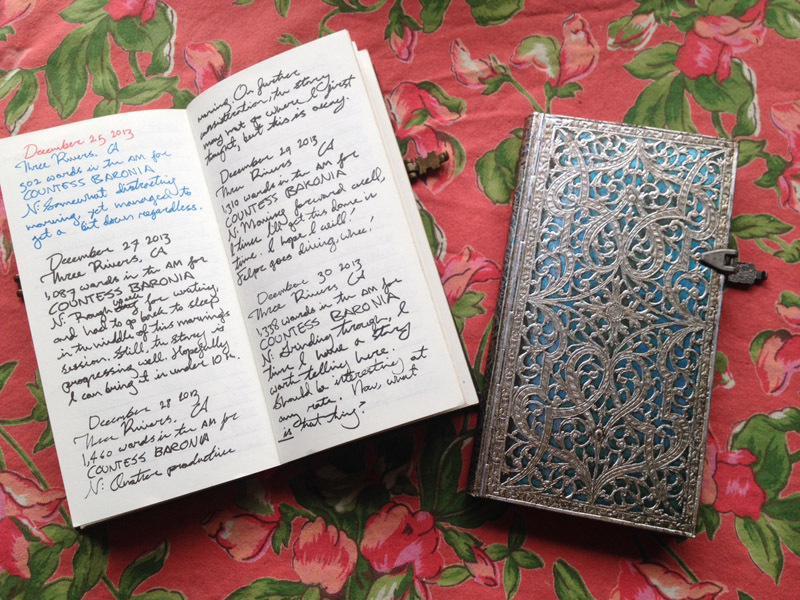 My first writing log was a Nocturnelle Slim, the very first Paperblanks® book I ever got! I started it in October 2012, and it lasted until the beginning of this month (March 2014)! I have now moved on to a Silver Filigree Maya Blue Slim. 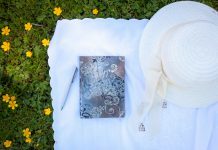 I like the Slim journals specially, and I only use them for my writing logs. Their shape reminds me of a door and, what with the wonderful covers, they are like magic doors to fantastic places. Since my stories run the gamut from swashbuckling space adventures to dark and urban fantasy, this seems only fitting. Do you have any specific themes you refer to frequently? I think one of the most recognizable themes in my work is the subverting of clichés and literary archetypes. As someone who’s a bit of an oddball, I know how suffocating it can feel when you don’t see yourself represented in the media around you. Through my stories, at least in a little way, I try to change that. For everyone. It’s okay to be afraid to try new things. But you should try new things, anyway. If you must walk down a dark alley, square your shoulders and move like you own the night. It is, on the whole, better to understand your enemies than try to change their minds. It is good to be kind to other people, but it is also important to be kind to yourself. Just because you don’t understand something doesn’t mean it’s bad. Be polite to dragons. There is a voice in our heads. I think everyone hears it sometimes. It is the mean little voice that says “that’s not good enough.” It’s the droning monotone that pours out all the reasons we will never succeed. It’s the thing that hides behind the guise of responsibility when it says there are better things we could be doing with our time. Ignore it. It has nothing for you. Nothing but pain and despair and an empty road that ends in death and taxes. Or you can do what I did, and get a cute little dragon who’ll glare at you until you get your work done. Beatiful, beatiful and inspiring article! Thank you so much. I’m glad that this article spoke to you! We were so happy to get the chance to interview Goldeen – a very inspiring woman, indeed! We couldn’t agree more! We absolutely loved getting to know Goldeen and are glad that the feature is inspiring others, as well. We’re also happy to hear she introduced you to us!